When I was about 30 and a fairly new Christian, I found a lump in my neck and shortly thereafter had surgery for a thyroid tumor. It was an emotional time for me; I was single; I lived alone; I was scared. Thankfully, my new church family surrounded me with love and care – an outpouring I will never forget. But still, I’d never thought about possibly having cancer, and I was in tears a lot. Before the surgery, I had been singing in a community choir that was preparing a performance of Brahms’ German Requiem, and I deeply hoped I could still sing with that choir. Now, since I don’t read music, I took a little cassette player with the music on it (remember cassettes? no? well, they were before CDs) and I would listen to it in the hospital and then at home so I could memorize my part of the chorus. And listening, I would just cry – even though I was lying on my back and the tears would end up pooling in my ears. And then I would listen to the soprano and the chorus singing, “Yea, I will comfort you, as one whom his own mother comforteth,” and I would find myself crying with joy and relief, because I really did feel God’s comfort. Those moments stayed with me, as I’m sure many such moments stay with you all – the moments when Wisdom, or the Holy Spirit, or Mystery, come and almost touch us, saying against common sense, it will be well. And I believe those are our visions of God. God comes to us in many forms, not always recognized. Today we celebrate the Holy Trinity and in that doctrine the church has historically tried to address who God is, what God is like, how we experience God. Now there are jokes and Internet memes about how on Trinity Sunday it’s fun to count the heresies uttered by inexperienced folks preaching about the Trinity – so I’m going to admit right now that I’m not a theologian, I don’t have a linear, left-brain concept of the Trinity, and I can’t explain it all to you. I deeply admire people whose analytical minds and deep hunger to understand the Holy have parsed the paradox of three Persons in one God – but I’m not one of them. It’s like reading certain poems – I hear the words and my inner being says, YES, that’s true – but I couldn’t explain it intellectually for the life of me. When it comes to describing God’s nature, I pretty much vote with Iris DeMent when she sings, I think I’ll just let the Mystery be. I do love, though, the way our texts this morning give us a little picture show of the faces that God turns to us –we see Wisdom, a clearly feminine being, working alongside the Creator “like a master worker”; we hear the tender words of Jesus the Redeemer; we anticipate the poured-out Holy Spirit that will guide us into all Truth. Notice that Jesus says we cannot bear what He has to say – we cannot bear the pain and tragedy of life that He, and we, will experience — and so the Spirit must be the teacher, the comforter and the glorifier. The passage from Romans almost sings it, showing us that what we cannot bear sometimes, we endure and out of that blossoms hope and the pouring of the Spirit into and around us, and it doesn’t make “sense” but it isn’t non-sense. And maybe it’s more like a dance than pictures. 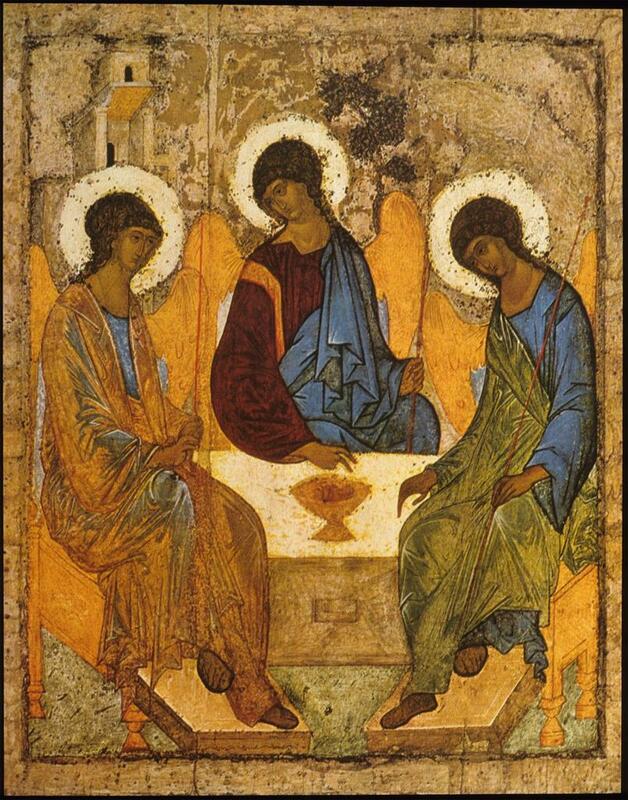 Now, here I’ll say I have learned one theological word that attempts to describe how the Three Persons of the Trinity interconnect – it’s the Greek term perichoresis, and its most common definition is “to dance around.” Isn’t that great? The Persons of God dance around and within each other, permeate, communicate, relate with one another. And from our viewpoint, as the dance goes on, we first see one face of God, then another, then another, yet it is all One God. When we suffer and feel it’s more than we can bear, we experience the consoling, strengthening Comforter. The dance changes and we celebrate the great delight and beauty of the Creator. We weep for our persistent, painful sins and call out for the Redeemer to heal and cleanse us. Each of these is our encounter with the Trinity, who is One. Maybe it doesn’t lend itself to easy understanding, but there is dancing, and what more do we need than that? If Jesus was raised bodily from the grave, why isn’t he with us bodily today? These are all different ways of grappling with a question at the center of Resurrection faith: where is our risen Lord, now? The great mystery of our faith was sparked by the fact that after the death of Jesus, his followers still experienced his presence. The New Testament documents these experiences in all their myriad forms: visions, appearances, a body not yet as solid as flesh, a ghost who passes through walls, a stranger on the way who suddenly becomes remarkably familiar. At some point in the early Church, the norm for experiencing the presence of Jesus beyond death came to be in community: wherever two or three are gathered; often, in the sharing of stories, intercessions, and in the breaking of bread. It was known that the power that brought human bodies together in this kind of communion with Jesus beyond the grave was the Holy Spirit he had promised in his earthly life. 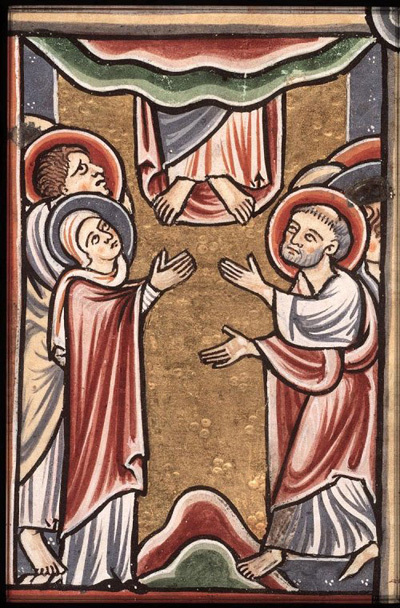 The risen Lord is here, among us, yet also beyond us, with God, a mystery that escapes the grasp of words and logic. Ascension stories are one way of trying to communicate this mystery in written form. Jesus lives bodily with the transcendent God of all creation, and dwells spiritually in the bodies we lend to his service here on the earth. Jesus brings something of our humanity with him to God, and through his Holy Spirit with us we bring something of God to those we encounter every day. Part of our faith believes that the distance between our God and our humanity has been forever wed in the death and new life of Jesus, and grows closer and closer still every day. 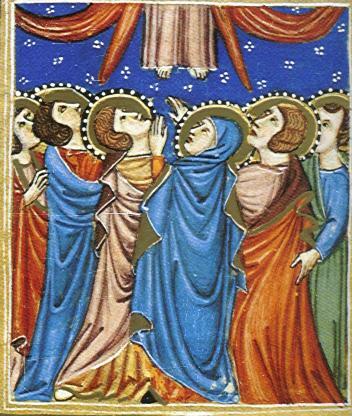 I am perpetually fascinated by artistic depictions of the Ascension. 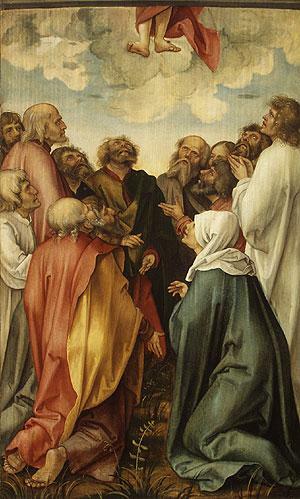 In many paintings such as the one above by Hans Seuss von Kulmbach, the only thing we see of Jesus are his feet, just before they are taken into a mysterious cloud which the disciples gaze heavenward towards. For me, they are a symbol of the last thing the disciples might have been able to grab hold of before having to part with the tangible, bodily reminder of their friend and teacher. If you have ever experienced the loss of a loved one, you may be familiar with the surprises that come with what we are able to hold on to. It may be a photograph, a book, a place, something or somewhere that we can hold onto and ground ourselves in with our memories. As we begin to release our hold on these objects, we may make our peace with the fact that our beloved dead have gone to a place where we, for a time, at least, cannot follow. What new life comes in that release? What relationships grow in the letting go? The body of Jesus was familiar to his followers, without it, what new expressions of his life were born! A few summers ago, while I was interning as a hospital chaplain in San Francisco, I wrote a poem about this letting go, you can read it here if you’re interested. 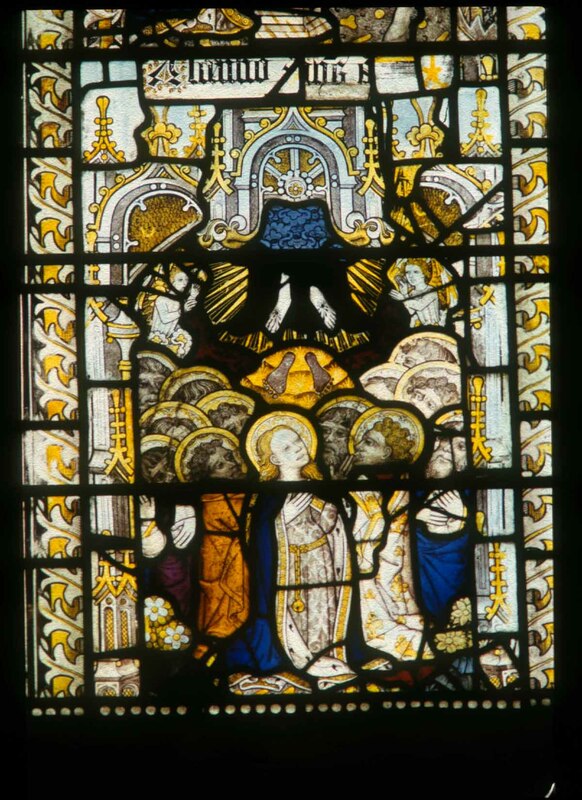 For this entry, I’ll leave you with a prayer for Ascension Day by Janet Morley, and the hope that we may all find rest between the letting go of our familiar loves and the spirit of new life waiting for us on the other side of our release.